There is nothing our family loves more than curling up with a good book in our DIY reading nook and reading as a family a few times a week as a substitute for television. 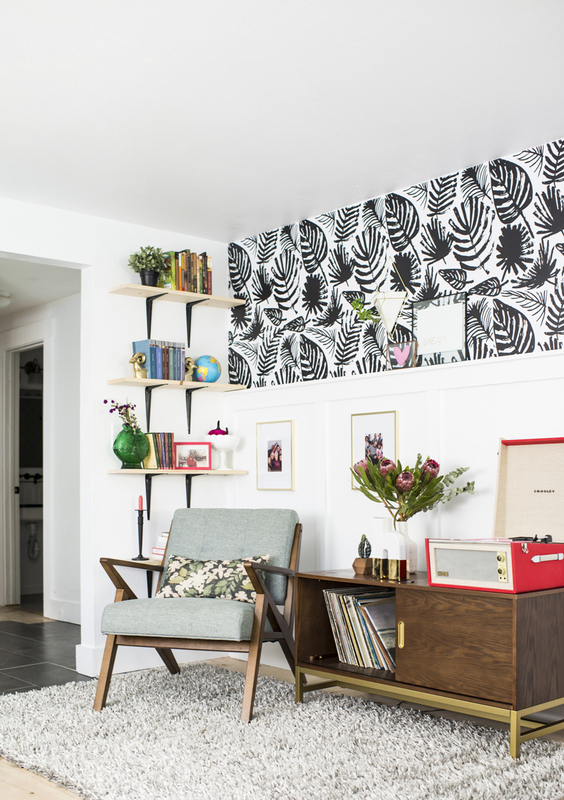 This room has gone through many changes, including the one that made this corner one of our absolute favorites! 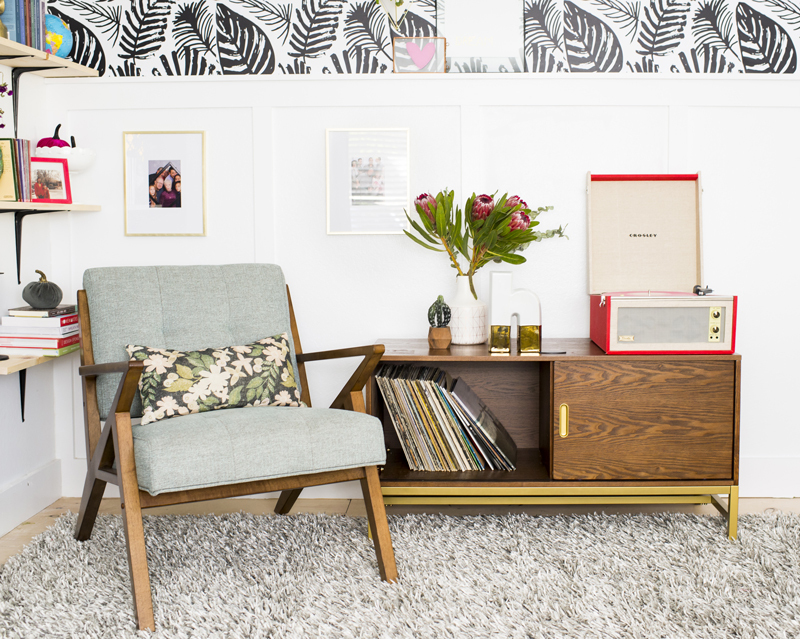 So, we decided to share our favorite reading nook ideas. I once heard that we should live in any house for at least a year before attempting a renovation. The reason being that we would have a better idea of how the house served our family and what things needed to change after living in it for awhile. This was not an option for us in this current home – as we jumped into gutting the entire house the day the papers were signed. ;) But, I have thought about it over this past year and find myself going back after the dust settles from a room renovation and tweaking a little here and there to make the space better fit our family. This is something I actually see myself to always be doing. As the kids grow through stages and as our family develops we will need different things from a space. Not being afraid to jump in and adjust it accordingly, will help us continue to love this house for years to come. 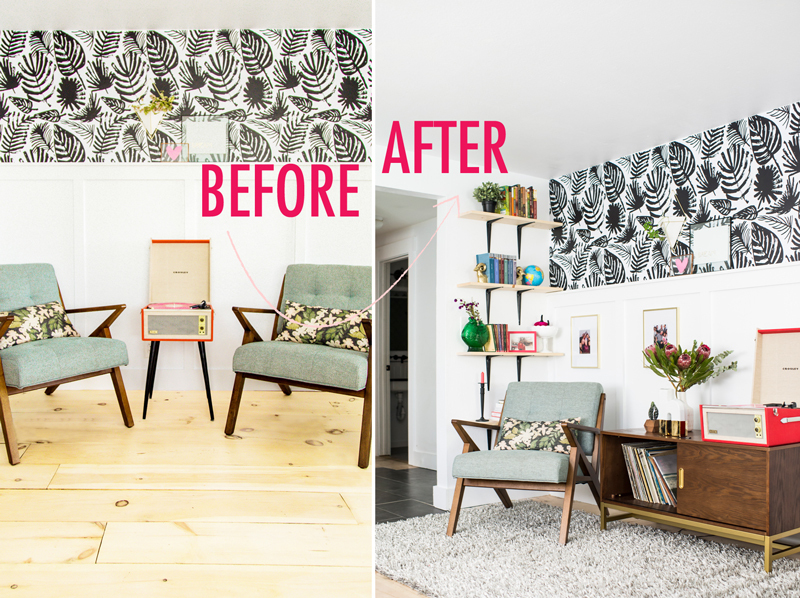 Here is the before photo from Our Living Room Reveal Post. It was a pretty photo, the space was fine enough, and there was nothing “wrong” with this corner per se. 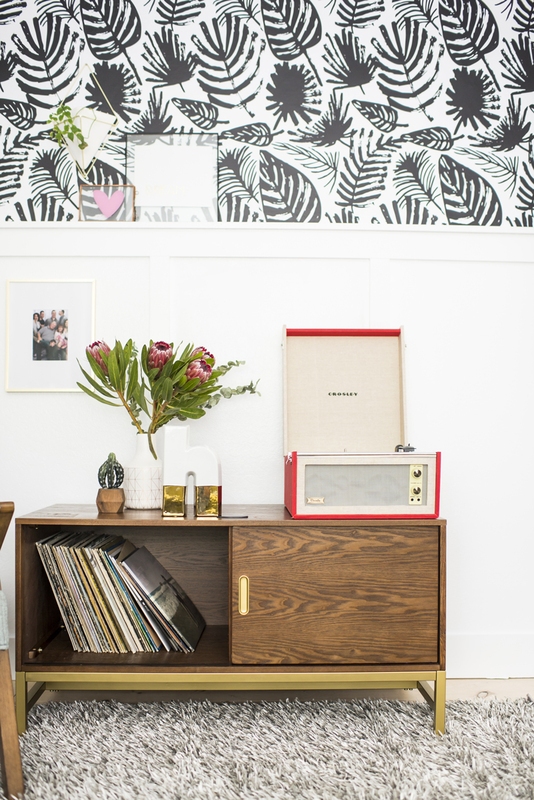 Except that we had no where to store our record collection, there was no where to set a drink if you wanted to sit in our favorite chairs to read a book, which was probably fine enough… because we had very little book storage in our living room anyway. But fine isn’t enough… when the entire point of a home renovation is to make spaces that aren’t just pretty in photos, but also loved in our daily using of them. We needed this space to fill our actual needs, and after seeing a ton of reading nook ideas, we went for it. Now I can’t even imagine not having this DIY reading nook at home. 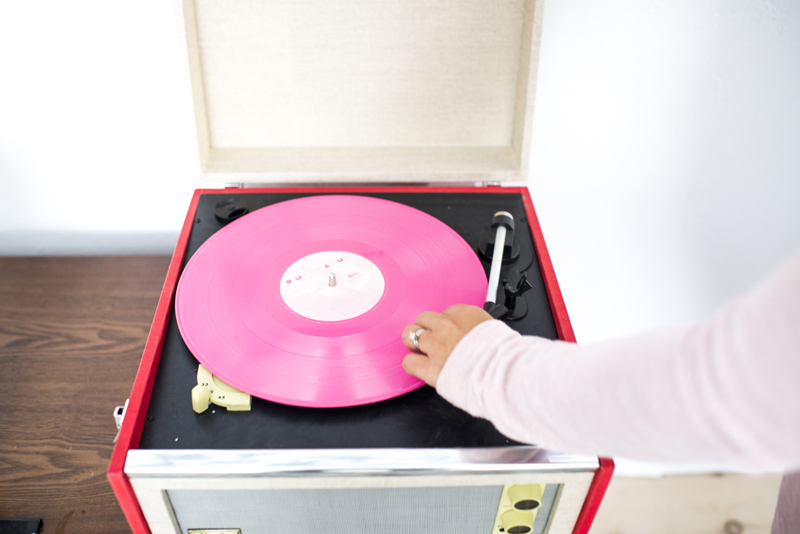 The first thing we did was find a decent storage option for our records, this media counsel is perfect and it also serves as a side table (drink holder) for the chair. Then we built up on the wall and added shelves. 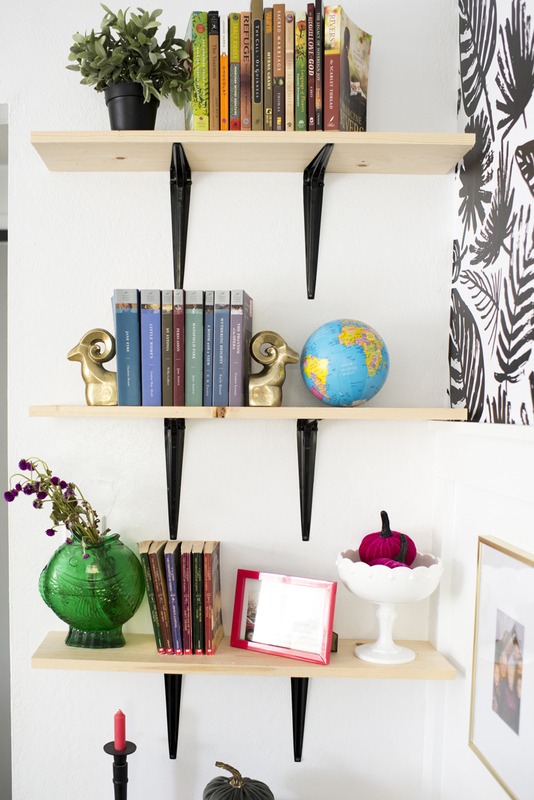 Simple wood and bracket shelves are incredibly easy and affordable to make. This set up cost us under $40 to put together! Here are the simple black brackets we used. I’ve always loved the look of raw wood shelves, we used them in the kitchen renovation and the kids bathroom renovation as well. Placed alongside the DIY white washed pine flooring the unpainted shelves look natural in the corner. 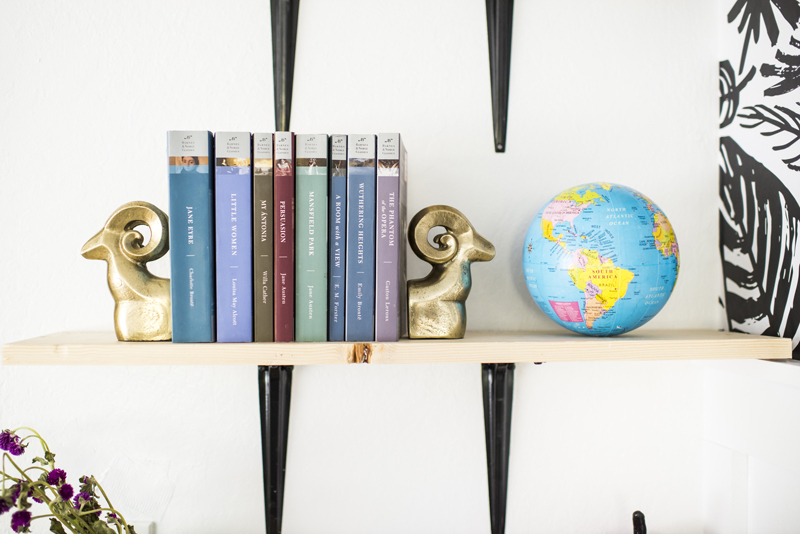 They are also a beautiful display for your favorite books in your DIY reading nook! We added a few thrifted treasures to the shelves and framed a couple family photos to make the space even more our own. 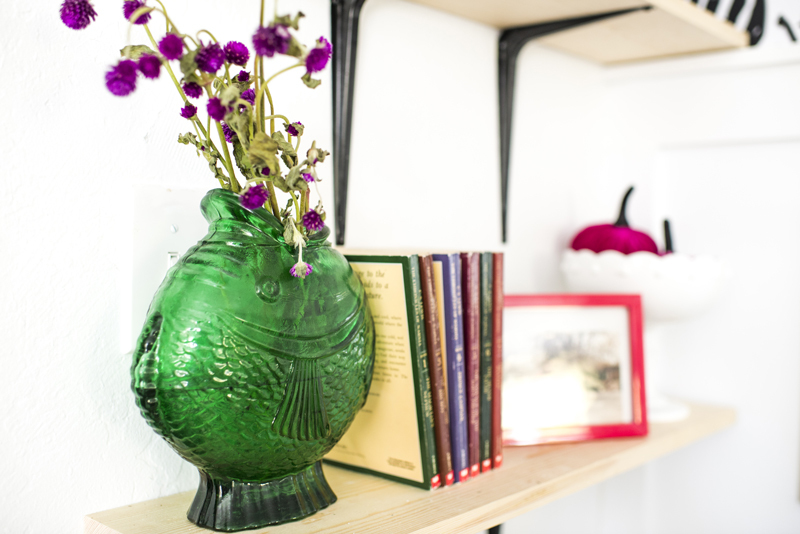 Are there any corners in your home that are pretty, but not serving you well? Jumping in and adjusting here and there can so quickly turn a space from never used — into a favorite spot at home. 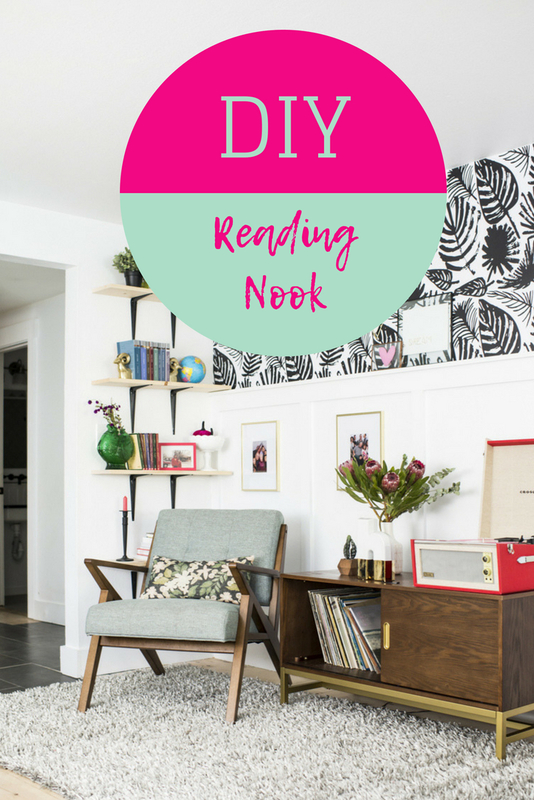 Especially with fall and all the cozy feelings happening right now, it’s a great time for making a DIY reading nook and adding a little refresh at home. And since I know we have so many new readers every month, here’s a bit of a recap of the work we’ve done so far on our #FestiveHome. Can’t wait to show you the next space soon! Let us know your favorite reading nook ideas! (Photography ©A Subtle Revelry by Ali Denney).